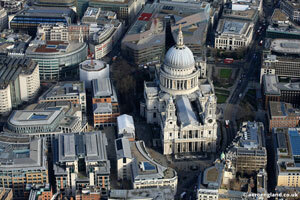 In October 2011, Occupy London set up camp outside one of London’s most beloved institutions, St Paul’s Cathedral. Soon, the building that had famously survived floods, terrorist threats, and the Blitz closed its doors, and the City of London took legal action against Occupy to remove protesters — by force if necessary. 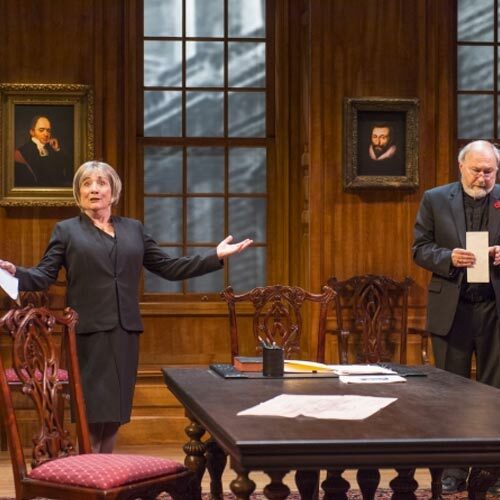 Steve Waters’ new play is a fictional account of the behind-the-scenes machinations by the church and city leadership, dramatizing the turmoil faced by principled, thoughtful people who must decide which of their ideals they’ll betray. 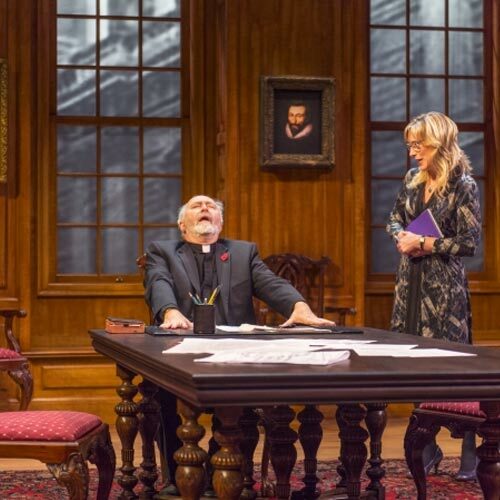 Temple was a recent hit at London's Donmar Warehouse. Enriching... Isn't this exactly what theater is supposed to do - make you empathize with a point of view you're inclined to reject - yet so rarely actually does? J. MICHAEL FLYNN* is extremely happy to be returning to Aurora after eighteen years. He was recently seen in ART at Center Rep. During more than four decades in the theater, Mr. Flynn has worked with–among others–A Contemporary Theatre, Alabama Shakespeare Festival, American Conservatory Theatre, Arizona Theatre Company, Baltimore CenterStage, Berkeley Rep, Boise Contemporary, Brooklyn Academy of Music, Center Rep, Cleveland Play House, Geva, The Goodman, The Huntington, Idaho Shakespeare Festival, The Long Wharf, The Magic, North Coast Rep, The Old Globe, Oregon Shakespearean Festival, P.C.P.A., Pittsburgh Public, Portland Center Stage, San Jose Rep, Seattle Rep, Syracuse Stage and The Sundance Institute. His Hollywood career can be found on the IMDb. BTW, Mr. Flynn is continually in wonder of and deeply grateful for Mrs. Flynn. LEONTYNE MBELE-MBONG was last seen at the Aurora in Breakfast with Mugabe. 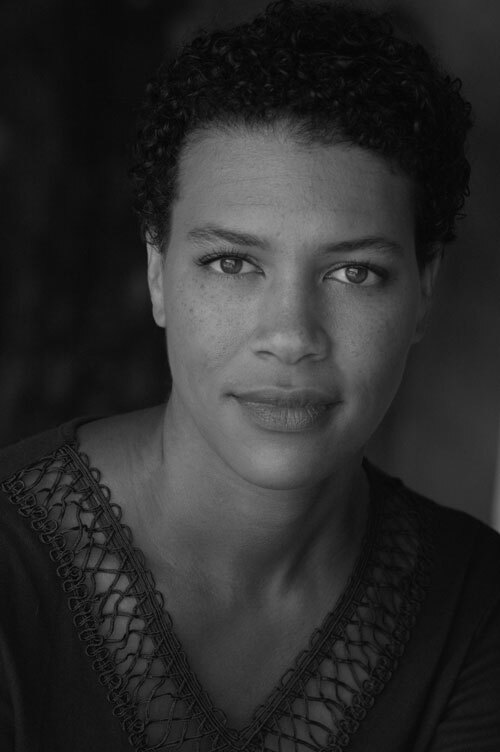 Recent credits: Lettie in Leaving the Blues (NCTC), Roach in Slaughter City (Stanford Rep), Cleopatra in Antony & Cleopatra (African-American Shakespeare, TBA Award Finalist). Other Bay Area credits: Medea: Medea (TBA Award Winner), Beatrice: Much Ado About Nothing, Mistress Ford: Merry Wives of Windsor, Ruth: A Raisin in the Sun (AASC); Rose: Fences (Altarena Playhouse); Andromache: Andromache (Central Works); Buckingham: Richard III, Orsino: Twelfth Night, Lady M: Macbeth (Woman’s Will); World Music (TheatreFIRST); Mayme: Intimate Apparel (Solano College); The Road Weeps, The Well Runs Dry (ACT’s First Look). 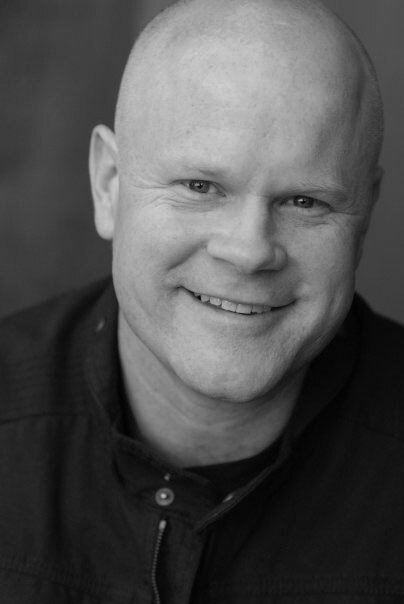 MIKE RYAN* is pleased to return to Aurora Theatre Company where he has previously appeared as Anatol in Anatol. Recent Bay Area appearances include The Hard Problem, Indian Ink, and Napoli! at American Conservatory Theatre, as well as Hamlet, Much Ado About Nothing, and As You Like It at Santa Cruz Shakespeare, where Mr. Ryan serves as Artistic Director. Regionally, he has worked at The Denver Center for the Performing Arts, Geva Theatre Center, Pasadena Playhouse, and La Jolla Playhouse, among other theatres. He received his BFA from SMU, and his MFA from UCSD. 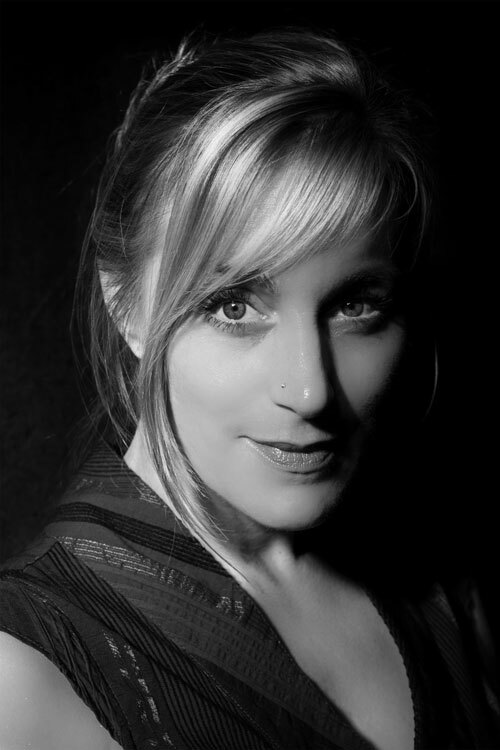 SYLVIA BURBOECK is thrilled to be making her Aurora Theatre Company debut. Most recently she appeared as Cora in Going to St. Ives (Aluminous/Flight Deck). Other favorite credits include Sonia in Life x 3 (Off Broadway West), Annie in The Real Thing (Broadway West), Jessie Mae in The Trip to Bountiful, and Artie in Eleemosynary (California Conservatory Theatre), Lettice in Lettice and Lovage, Eleanor in The Lion in Winter, Miranda in Expecting Isabel, and Christine in Mourning Becomes Electra (Role Players Ensemble). Sylvia holds a B.A. in Theatre from Tulane University. 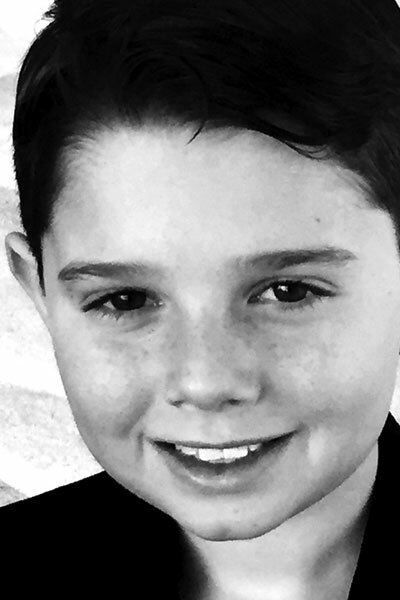 GRADY WALSH is honored to be cast in his first professional production at Aurora Theatre Company. He began acting with Bay Area Children's Theatre as Frankenguest in Dear Edwina Jr. and Prince Charming in Cinderella KIDS. It gives me a great deal of joy to be in this production of Temple. I would like thank my mom for encouraging me and my family for taking the time to help me run my lines. JACK WITTMAYER Jack Wittmayer is thrilled to be returning to the Aurora Theater Company, where he was last seen in Little Erik. Jack has also participated in several productions at The Berkeley Playhouse, including Aladdin, The Jungle Book and Little Mermaid. 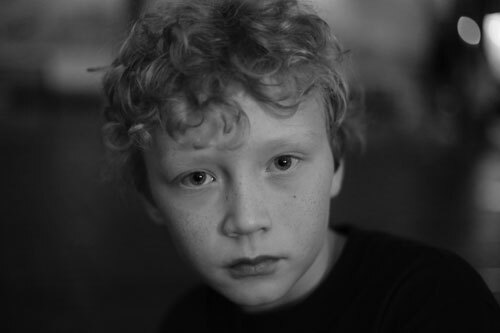 Jack is currently a student of theatre at Oakland School for the Arts, where he continues to foster his love for acting. 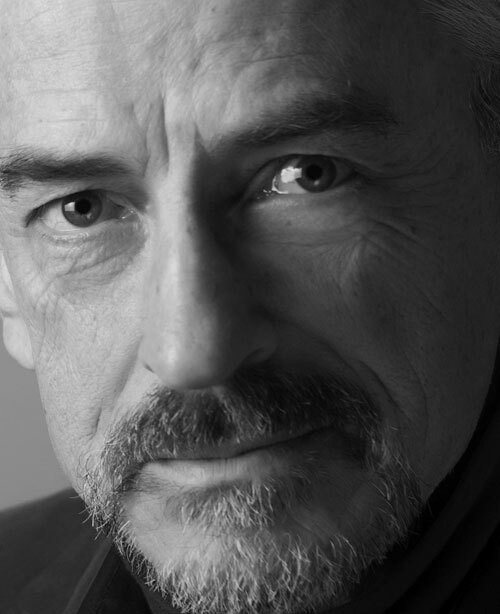 PAUL WHITWORTH* began his professional career at the Royal Shakespeare Company (1976-1982). 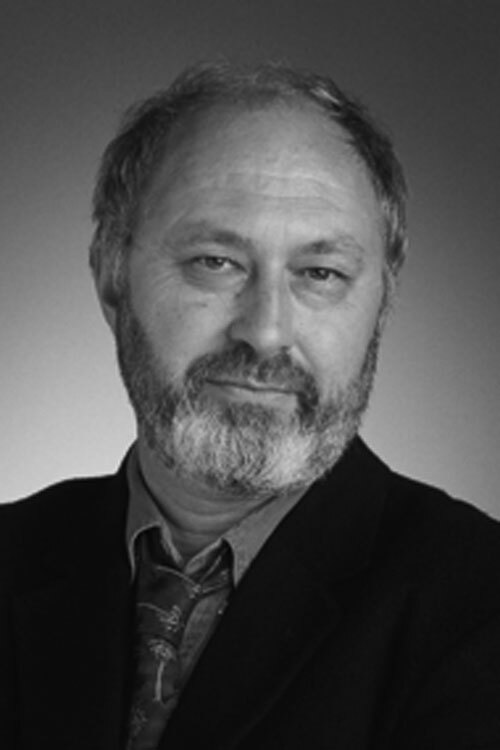 In 1984, he joined Shakespeare Santa Cruz, where he produced, directed or acted in many productions, serving as Artistic Director from 1996 to 2007. Other Bay Area credits include leading roles in Night and Day at American Conservatory Theatre; Blue/Orange at Aurora Theatre; Shining City at San Francisco Playhouse; Krapp’s Last Tape and One for the Road at Jewel Theatre and The Pitmen Painters at TheatreWorks. 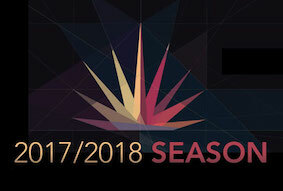 Other recent leads include Galileo in The Life of Galileo at Asolo Repertory Theatre, Forrest in Hurricane (world première) by Nilo Cruz at the Ringling International Arts Festival and Christopher in Tribes at Berkeley Repertory Theatre (SF Bay Area Theatre Critics’ Circle Principal Actor Award). SHARON LOCKWOOD is making her Aurora debut with Temple. For over 30 years she has performed regularly at Berkeley Repertory Theatre, most recently as Emma Jessup in It Can’t Happen Here, and as Sonia in Vanya and Sonia and Masha and Spike, for which she received a Bay Area Critic’s Circle Award. Other favorite Berkeley Rep credits include: Zorro in Hell, The Alchemist, Volpone, Pentecost, Hydriotaphia, Reckless, The Magic Fire, Caucasian Chalk Circle, and the Oresteia. 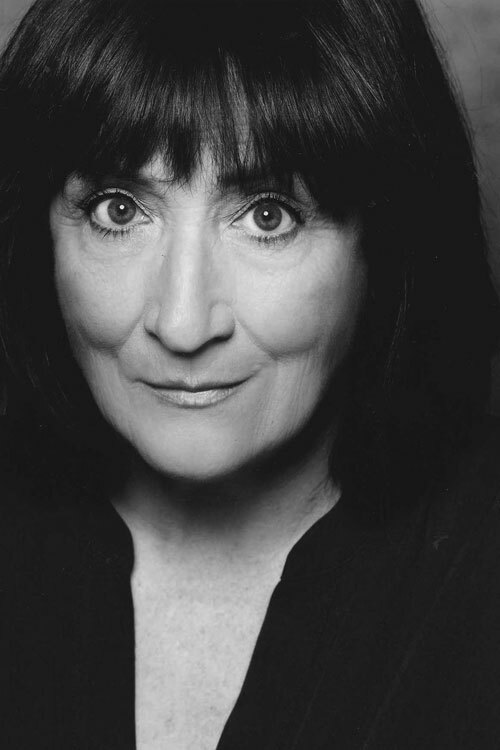 Sharon also appears frequently at American Conservatory Theatre, recently in Caryl Churchill’s Love and Information. Other A.C.T. work includes Napoli, Dead Metaphor, Hedda Gabler, ‘Tis Pity She’s a Whore, and A Christmas Carol for 12 seasons. She originated the role of Barbara in the world premiere of Nickel and Dimed, under the direction of Bartlett Sher at Seattle’s Intiman Theatre and the Mark Taper in Los Angeles. She reprised the role here in the Bay Area in a Theatreworks/Brava co-production. Among her local credits: numerous appearances at California Shakespeare Theatre, Marin Theatre Company, Center Rep, Shakespeare Santa Cruz, and many seasons with the San Francisco Mime Troupe. Regionally, she has worked at La Jolla Playhouse, Old Globe, San Diego Rep, Seattle Rep, Missouri Rep, Arizona Theatre Company, Milwaukee Rep, and Long Wharf Theatre. Sharon was honored with the 2016 Lunt-Fontanne Fellowship and participated in a Master Class retreat at Ten Chimneys in Wisconsin, led by Master Teacher Jason Alexander. 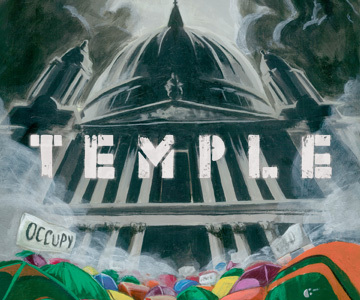 Temple is based on actual events surrounding the Occupy protests in London in 2011, during which St. Paul's Cathedral was closed for the first time in its long history. St. Paul's Cathedral stands in the center of the City of London -- a square mile area at the center of much the much larger London metropolis. The City, based on the old Roman walls of Londinium, now has a semi-autonomous local government and has developed into a global financial hub: one of the wealthiest areas in the world. 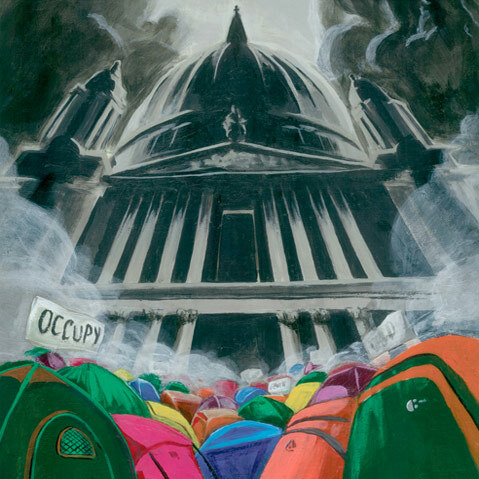 When the Occupy protesters were pushed from their original encampment outside the stock exchange, they settled in the nearby precincts of St. Paul's Cathedral -- inadvertently setting off a crisis of conscience that threatened to destroy a 1400-year-old institution. 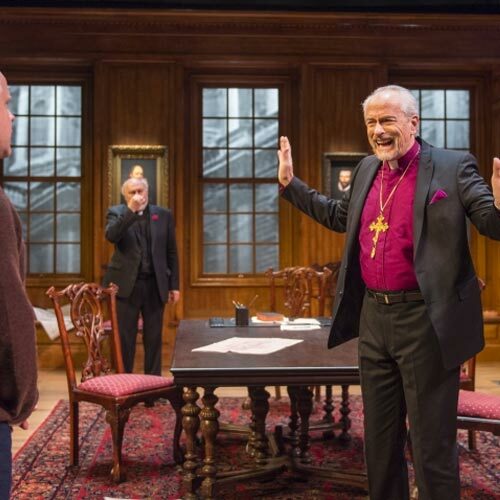 Three of the characters in the play are fictionalized versions of real people at the center of the storm of national debate triggered by the closure of the Cathedral: the Right Reverend Graeme Knowles ("The Dean"), the Right Reverend Richard Chartres, Bishop of London ("The Bishop"), and the Reverend Giles Fraser ("the Canon Chancellor"). Read more about some of the people and events mentioned in the play. JC: What was it about the situation with Occupy and St. Paul’s that inspired you to write this play? SW: I am always fascinated by the unseen events that drive our lives – going backstage on reality as it were; and the response of St. Paul’s to the arrival of Occupy played out in public and in private – one very visible resignation by a senior cleric (Giles Fraser; on whom the Canon Chancellor is based) and one mysterious almost unexplained one by the Dean, Graeme Knowles. Whilst I was moved and inspired by the ideas and passion that drove Occupy I felt my imagination being kindled by those professional and personal crises and felt they somehow spoke to a wider crisis in our values and our institutions. So I decided to see if I could dig a little deeper and so the play emerged. JC: In writing the play, you interviewed the people on whom your characters are based. How did those interviews inform your writing? SW: The interviews came at different points for different reasons – for me they are as much about engaging with the people involved as finding anything specific out; I can only go by my imagination of who those people might be and an interview simply confirms that rather than defines it. What was equally helpful was going into the cathedral, meeting people in Amen Court where the Chapter are located, getting into Chapterhouse; my imagination is driven by actual spaces – and the strange conjunction of past and present, public and private that these worlds offer, the way they lead you down the rabbit hole of an ancient institution surrounded by the most globalised forces – the City of London – and the challenge to that fact by the improvised forces of Occupy; all this really ignited my thinking. JC: How did the people you interviewed react to the play? 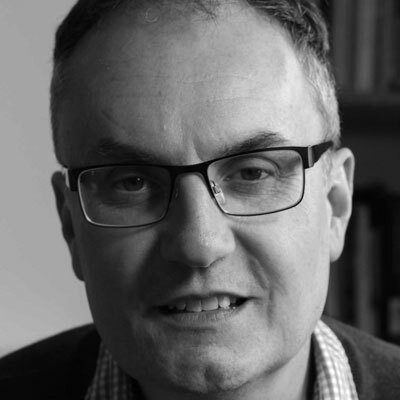 SW: Largely positively; but it’s still a traumatic event for some of those involved and represented, so they either didn’t go or felt aggrieved; that’s a risk you run – I am here to speak for the audience not individuals; I suspect for the actual Dean it did enable a kind of restitution but that’s claiming a little too much. We’re in a different political moment now than we were during the height of Occupy. JC: How do the themes of the play still resonate for you? SW: Ever more so; obviously what’s happened in your country is terrifying and ours too – the resurgence of right-wing politics is a distorted reflection of the anger that drove Occupy to try and pull the emergency brake world-wide; but there’s so much more hope in their vision as compared to Trump, [British Prime Minister Teresa] May and the like. 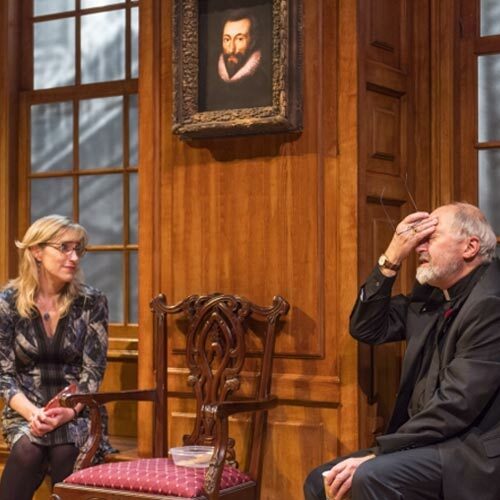 Whilst the play takes the Dean’s doubts and vacillations seriously, what happened in St. Paul’s was clearly a disaster, a succumbing to pressure and power in an organisation designed to think beyond the demands of money and might. Where he offers some hope is in his attempt to ask whether the past can help us re-think our current dilemmas – the memory of a different London, a different Christianity, a different world might re-frame the climate of fear and coercion we suffer under now. "Aurora has always showcased fine actors. But in this case, they’re downright phenomenal." "directed with admirable precision by Aurora's artistic director, Tom Ross"